The year young Morris Porter was born, 1911, it was still popular to clothe infants in the androgynous white dress that first appeared in the Sears catalog in 1896. Children under three years old wore white to emphasize their purity and innocence, as well as the simplicity of one’s life. The re-making of this dress kept the dressmakers busy during the Edwardian era of 1908-1914. 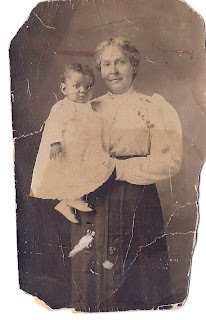 Baby boys, like little Morris Porter, born before WWI, donned this white dress, not using color to distinguish his gender until about the age of three, when he became “a big boy” and transitioned into trousers, also probably given his first haircut. Morris Porter, born 13 March 1911, in Kingman Kansas, recently passed away at the age of 97 years, 4 Dec 1911 in Wichita Kansas [i]. He graduated from Kingman High School in 1928, and played with a popular jazz band in Kansas City, after attending three years of college at Southwestern College, in Winfield, Kansas. He served as a Warrant Officer in the US Army from 1942-1946 where he was stationed at Ft. Huachuca, AZ and the South Pacific. He then joined the railway Postal Service in 1946, where he worked until retirement in 1971. His expertise was in the territories of OK, KS, IL, MO, and AL, but after 1965 when the railway mail ended, Morris remained in Nebraska with the Postal Service. He was married twice, first to Margaret Giles for about 5 years and then to Melba Walker from 1946 until her death in 1982. Morris and Melba had one daughter, who still resides in Wichita[ii]. He was given the family name Morris to keep alive the long heritage of the Wiley J. Morris family. His grandfather Wiley J (Tobe) born in 1838 was born as a free colored [iii] having never been a slave since he was born to Louisa Griffin (Morris), a free woman. 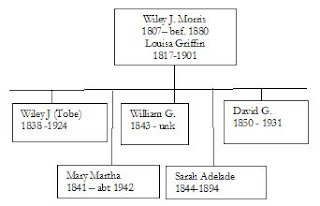 Louisa was Morris Porters’ great-great Grandmother. His Grandpa Tobe, who had eleven children, one being Nola, born in 1869, is shown holding little Morris Porter. As I have another photo of Morris, at about the age of 8, with his Grandma Nola, I will compare the two fashions worn by Nola in my next blog. You might find it interesting that like Nola, most of Wiley and David Morris’ 13 daughters shared an affinity for Lane Bryant, which luckily for them, had a booming catalog sales business by 1915. Part II, Edwardian Fashion for the Ample Body. Wonderful photograph and story.I have a cherished photo of my grandfather dressed in a similar gown with his long curls! Interesting, you learn something new everyday. I was not aware the reason behind the neutral color, now I know.